It’s been 5 months since moving from Maui to San Diego. I’ve had fun exploring the area — hanging out downtown, visiting north county, surfing cold water, eating delicious Mexican food and much more. San Diego is an awesome place. It’s beautiful, diverse and there’s plenty to keep me busy. 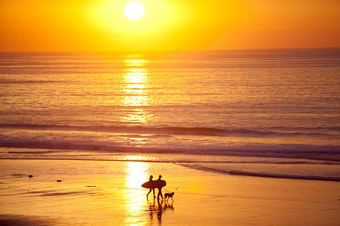 When it comes to living on the mainland, San Diego — Actually, Encinitas would be my town of choice. However, there’s nothing anchoring me to San Diego. Hawaii still feels like home. My friends and lifestyle are primarily in Hawaii. The ease and enjoyment of life in the islands is unparalleled. Constantly putting yourself out there to make new sets of friends gets exhausting when you’ve moved every year for 9 years. Ultimately though, San Diego is a place I could be happy living, without question. Go Back to Hawaii! You won’t regret it. I moved to San Diego from Boston and had a similar experience to you. Not enough work and enjoyment and money going out constantly. Plus, I missed Boston like crazy. I called my former boss and asked for my old job back and returned to Boston and stayed happily for years. Don’t get me wrong on San Diego–just like you said, it’s a beautiful and wonderful place. I had lived successfully in San Diego years before and even attended grad school there before returning the second time. Sometimes you just belong in a place and you know it. My city days are far behind me now and I love my life in the Ozark Mountains and I wouldn’t have it any other way. I’d say based upon what you’ve written that the two of you belong in Hawaii. I say Return, Stay and Make a Home! Also, I appreciated it when you said, “Some days I love San Diego, but every day I love Hawaii.” That is a very good way of putting things and I’m going to apply that philosophy in my life. Thank You! Haha, Hotlanta? No thanks. 😉 Georgia has some gems though… I love Savannah.